Highland Lake Son-Kul is located between the ridges Sonkultau and Moldotau at an altitude 3016 m above sea level. 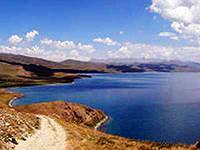 It is the largest natural fresh reservoir of Kyrgyzstan, its area is 278 square kilometers, and the average depth is 8.6 m, a maximum is about 14 m, the length of the lake is 28 km. The shores of the lake are low, sometimes overgrown with reeds. There are valuable species of fish and 69 different species of birds. The lake is home to valuable species of fish and 69 different species of birds. Depending on the weather, the water in the lake Son-Kul is painted in different colors - purple, blue, yellow, or orange. Unlike other lakes there are no trees. Here you can enjoy a variety of bright and rare species of flowers. There are such carnivores as wolves, foxes and snow leopards on the banks of the lake. The bottom of the lake is rocky, covered with algae. Son-Kul Lake is home to the majority of waterfowls. Here you can see them from May to September. In summer there is a wonderful opportunity to live in the national dwelling - yurt and enjoy the Kyrgyz national drink - kymyz, which is known to have many healing properties. Son-Kul Lake is a place frequently visited by tourists of big cities, because here you can relax from the city bustle, enjoying the unusual beauty and amazingly clean air.